Since leaving my 9-5 job in February, my body clock has been quietly readjusting. No longer do I wake up a minute before the alarm sounds, nor do I habitually go upstairs at 11pm, programmed to fall asleep the minute my head hits the pillow. Instead, my bedtime is creeping back, getting later and later. I’m having way too much fun to want to go to bed. This subconscious readjustment has always happened during my two-week Christmas break. By the end of the fortnight, I reach my natural state: waking refreshed around 9am and hitting the hay around 1am. Holiday over, I ditch my body clock and take my cue instead from the radio alarm, permanently tuned to Radio 4. Listening sleepily to whatever is on, I can tell whether we are running late. Farming talk: safe to doze. News headlines: jump up and get busy. Sports Report: overslept, but I can still make it to work on time if I hurry. Thought for the Day: I’m in big trouble. Putting the clocks forward or back at the end of March, as we have just done, has never affected my sleeping habits, so long as I’ve remembered to adjust the radio alarm (and John Humphrys had done the same to his). Now that I’m liberated from my job, I’d rather do away with my watch and my radio alarm and listen to my body clock instead. Now I no longer have to get to the office by a fixed time, I just wander into my study when I’m ready and take a seat at my desk. 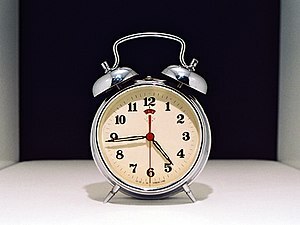 Surely following my body clock must make for a healthier lifestyle. After all, it’s not that long since it was common practice across the country to take the time directly from the sun. It was only the construction of the London-Bristol railway that caused this part of the country to reset its timepieces to match the capitol’s. Apparently, we were far enough west for our day to run 11 minutes behind central London’s. This would have made the first London-Bristol train timetables bewildering, were it not for the fact that the newly built Temple Meads Station helpfully offered passengers two clocks, one showing local time, the other “Railway Time”, i.e. 11 minutes earlier. Unfortunately, there is just one small obstacle that will stop me from giving full free rein to my body clock: my daughter still has to get to school by half past eight. So it looks as if my household will also have to keep two clocks, one for London time, the other for Debbie time. I wonder if I can persuade Hawkesbury School to do the same? This post was originally published in the April 2010 issue of the Hawkesbury Parish News.